A few alleged press shots of the Sony i1 Honami cameraphone have leaked out on ePrice, and they pretty much mimic the pressers that were leaked to an Xperia blog recently. The Honami, it seems, won't have bulky camera protrusion on the back, like the Lumia 1020, but then again, judging from the accompanying sensor specs, it won't be as advanced as a cameraphone either, but will have the advantage of running Android and being slim, so these two are geared to different customer bases. The source regurgitates all the leaked specs so far, like a 5" Full HD Triluminous display, 2.3 GHz Snapdragon 800 chipset, 2 GB of RAM, 16 GB of memory plus a card slot, IP57 watertight certification, and a 3000 mAh battery. We are now learning that the aspheric tech will go as Sony Lens G, with 20.7 MP 1/2.3 camera sensor, and a dedicated BIONZ ISP. The sensor size is somewhat of a disappointment given what Nokia churned out, but let's not forget that the i1 Honami stuffs it all in an eventual 144 x 73.9 x 8.3 mm thin body, coming in white, black and purple. It would not be on par with the Lumia 1020, but should give the current Android camera king the Galaxy S4 a run for its money, so we can't wait for the first samples to trickle down. Looks pretty plain to me, and like any other Sony phones. I thought it is supposed to be a bit different. 144mm x 74mm x 8.3mm, I don't care about thickness, but dam this phone is even taller and wider :(, I was hoping it be smaller or at least the same. I'm 5'8", so the Xperia Z was already pretty much the max size for me to use it with one hand. Now I am more interest in the Lumia 1020, but it also depends on what other features the Honami has. its alot better than 1020 at 10+mm thickness. surely the sensor is little smaller 1/2.3 compared to 1/1.5 of 1020 i think we shouldnt complaint about this device it runs android and is offering 2 best camera in phone. this is obviously specs wise speaking. once phone is out and we can compare the samples from each phone then it will actually show which phone camera is best. Personally I'd prefer it to be 10 mm thick and the height and width of the Xperia ZL. I agree that specs aren't everything, we have to wait for the samples of the Honami to find out which is actually the best. Well, it does have a triluminous display, which uses nanotubes fro enhanced color. This is actually pretty appealing to me. I've seen the triluminous display's. They place LCD's on par with OLED's as far as color accuracy is concerned. Well, well...a G lens might not be too shabby at all!! The T series will take some time to take it's course on smartphone cameras. What aboout: Nexus 5, maybe Motorala will make a flagship, LG Optimus G2 or the Note 3.
waiting for Nokia lovers... oh sorry, camera lovers. It's okay, it's still almost twice as big as the 1/3" on spectacular S4 Octa which only drags in low-light, so even at 20MP, individual pixel size will increase, and if the RGBW filter will be included (unlikely at this point), low-light will be even better, while level of details will be around 13MP (there's some degradation when converting RGBW to traditional RGB). Man, I thought it'd be sexier... The bezels are unattractive and make the whole device look small. exactly, as far as Sony claimed this phone is going to be the sexiest Sony phone so far i expected something more attractive. wish the real one be something sexier. those bezels are ok if they promise to give us that 3000mah battery. it is said to be 4mm taller than xz. disappointing. after hearing many great things about this upcoming flagship, this is really below expectations. let's just hope the battery does not get downgraded again. it's just like the xperia z rumors. from godly odin specs to the small battery and the poor actual performance. No Sony, You disappointed me again. Don't follow Samsung. Same design for all your phones with different screen size is a huge thumb's down for me. Where is your designers ? You are nowhere of Sony Ericsson designs. They had unique designs. Their box design, Thats what a normal user call it. its tough to hold earns no point from a user experience perspective. 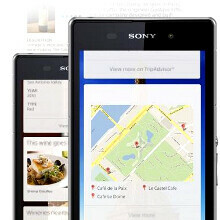 These design exist from the Xperia NXT series like U, P,S etc.They just covered with a glass. "Omnibalance" sounds good. Where do you see the s/p/u in the z/zu? Honami + note 3 = FTW !!! why would you get that redundant combination? both are android devices. note 3 or xz ultra + lumia 1020 will be a better combo. you get two platforms with one boasting an outstanding (probably unbeatable) camera. That works too. Let me revise it. Cameraphone + phablet = FTW!! !